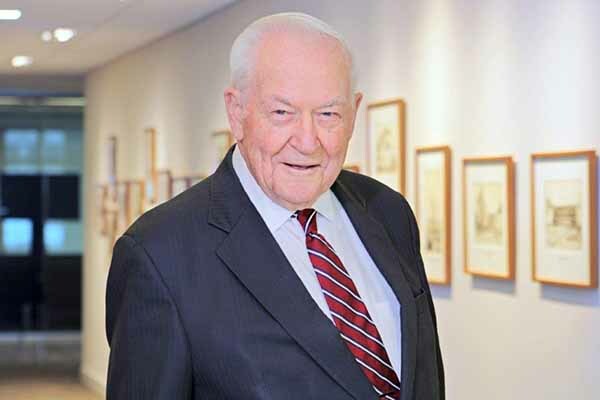 The Jewish Federation of Cleveland today announced that Richard W. Pogue has been named the 95th recipient of the Charles Eisenman Award, the Jewish Federation of Cleveland’s highest civic honor for outstanding contributions to our community. The Federation will recognize Pogue and celebrate our community at the 115th Annual Meeting on Monday, April 8 at 7:00 pm at Gross Schechter Day School (27601 Fairmount Blvd, Pepper Pike). All are welcome to attend this free event. For more than half a century, Pogue has been serving the Cleveland community in a variety of civic capacities. His engagement began in the 1960s, when he helped create the Greater Cleveland Neighborhood Centers Association, where he worked to advance health care, social services, education reform, economic development, and the arts in the inner city. Pogue has been involved in more than 50 nonprofit organizations, including the Cleveland Foundation, University Hospitals Health System, City Club of Cleveland, Case Western Reserve University, and American Red Cross. Additionally, Pogue has spearheaded multi-million dollar fundraising campaigns at the United Way of Greater Cleveland, Cleveland Institute of Music, and Gordon Square Arts District. In his professional career, Pogue spurred Jones Day’s growth from 335 to 1,225 lawyers and five domestic offices to 20 worldwide during nine years as managing partner, making the firm the second largest in the U.S. His long career at Jones Day – where he continues to be active as an adviser on client development, special projects, and civic engagement – is a key reason the firm now has over 2,600 lawyers in 44 offices around the world. Pogue, of Shaker Heights, has served in the United States Army, and is a graduate of Cornell University and University of Michigan Law School. In addition to the presentation of the Charles Eisenman Award, the annual meeting will feature remarks by Tamara Cofman Wittes, Senior Fellow of Foreign Policy at the Center for Middle East Policy at the Brookings Institution. The program will also include an address from outgoing Board Chair Gary L. Gross and an election of Federation trustees. For more information or to RSVP, please visit www.jewishcleveland.org, email infomgr@jcfcleve.org or call 216-593-2900 x740.